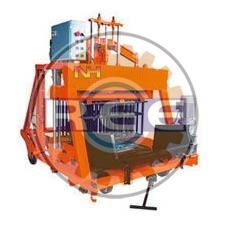 Using the latest technology and state of the art facility, we offer Semi Automatic Egg Laying Block Making Machine (RBM-03). We manufacture the high-class machine thanks to our skilled professionals and modern machinery at our disposal. The raw material used in manufacturing process is purchased from dependable vendors. The premium quality on offer makes it popular among customers. Get in touch to avail market leading rates. Travel Motor- 1/2 HP - 1440rpm, Mould Area - 860x500mm.